A couple weekends ago, I was lucky enough to photograph a wedding for a fantastic couple. As usual, I arrived plenty early to the venue — a beach wedding — and the stage was being perfectly set. People were bustling around making last-minute adjustments to make sure everything was absolutely perfect for the happy couple. And then, BOOM, a thunderstorm rolls in. But, as the saying goes, rain is truly a sign of good luck on your wedding day. The storm was brief and the ceremony and reception were a great success. Good luck was also on my side that day. As the storm passed through, in its wake was one of the most spectacular rainbows I’ve ever seen. 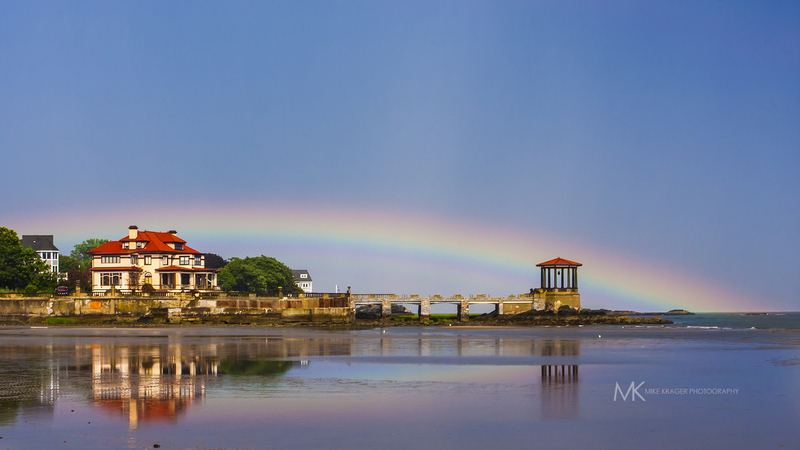 Its bright, vivid arch perfectly encompassed a historic mansion along the shoreline — so, naturally, I wasted no time in running to snap this photo. I’m incredibly proud of this shot, as it wasn’t easy. It was still raining as I ran down into the water to frame this one up. So, with two feet in the water and one hand shielding a heavy lens from the rain, I was able to steady myself enough to capture this scene. For those wondering, there was very little post-processing involved in this final image. I’ve only cropped the photo to this panoramic format and made some small exposure adjustments to help bring the colors out. I hope you enjoy! Love those moments! I was bummed that the bride wasn’t ready yet for this one. I was there prepping about an hour before the wedding when this happened. haha Mama Nature works on her own timeline I guess. That was here in CT? It was in CT. Milford (Woodmont area).